Cooking with kids is about more than just licking the bowl. GBBO winner and cookbook author Nadiya Hussain shares some great reasons to involve your child in the kitchen. Cooking with your child can sometimes seem like more hassle than it’s worth. It’s messy, it takes three times longer than doing it yourself, and the results aren’t always even edible. But while it’s not always easy, getting your kids involved in the kitchen can give them a whole set of skills that support what they’re learning at school. We asked Nadiya Hussain, winner of The Great British Bake-Off 2015 and author of the new children’s story/cookbook Nadiya’s Bake me a Story (£14.99, Hodder), to share the benefits of cooking and baking with your child. Okay, so we’re not suggesting you leave your child to their own devices with the biggest carving knife you own, but with supervision, even small children can master basic skills like chopping, mixing and rolling, and that improves their confidence, inside the kitchen and elsewhere in life. Try this: Start by letting your child use ‘safe’ kitchen tools. They could help you mash potatoes, stir cake mix and cut soft fruit and veg like mushrooms or bananas with a blunt knife. As they get older and gain confidence, you can introduce more complex skills and utensils. Cooking with your child is a great way to give them an at-home maths lesson without them even realising. ‘Weighing, measuring and working out cooking times are really important when you’re baking, and they all help them practise their maths, with an edible treat at the end,’ Nadiya explains. Measuring and weighing are key concepts of National Curriculum maths in Key Stages 1 and 2, and hands-on practice is one of the best ways to make sure the skills really sink in. Try this: Younger children can practise their numbers by helping you prepare the ingredients for a meal – for example, counting out how many sausages you need to cook for the family. Older children can start to weigh, measure and pour by themselves. Give their brain an extra challenge by baking a double batch of cupcakes or pancakes and getting them to scale up the recipe to find the right amount of ingredients and cooking time. If your child is a reluctant reader, getting them involved in the kitchen can help their literacy skills in a less pressurised way than sitting down and making them read their school book. ‘Reading recipes shows children how to follow a set of step-by-step instructions in the right order, and there’s no need to stick to children’s cookbooks: my children will often pick up a regular recipe book without even thinking about whether it’s meant for kids,’ Nadiya says. Recipe books will also introduce new vocabulary, and talking together as you cook helps to improve their communication and literacy skills. Try this: Take your child to the library, look through some cookbooks and borrow the ones that contain recipes they’d like to try. They could also practise writing their own instructions for a favourite recipe, or use our worksheet to write a step-by-step guide to making a sandwich. Try this: Let your child try to make something completely from scratch, with as little help as possible. For a Reception child, this could be as simple as a bowl of chopped fruit, while by Year 6, children are likely to be able to make a sandwich, heat a bowl of soup and even make you a cup of tea independently (hooray!). Try this: Just the act of cooking with your child and having conversations while you’re busy is a brilliant way to bond. 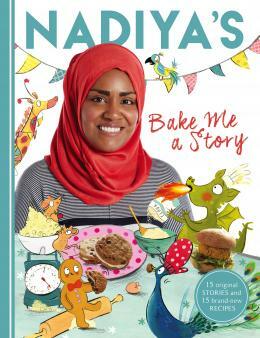 Nadiya’s Bake Me a Story features 15 reworked fairy tales, such as The Not-Just-Ginger Gingerbread Guy, each followed by a recipe relating to the story, so you and your child can enjoy reading and cooking together at the same time. Healthy eating and childhood obesity are hot topics, and there’s plenty of evidence to suggest that children who develop good eating habits early in life are likely to stick to them as they get older. Cooking together is a good opportunity to talk to your child about nutrition without the emotional overtones that often come with discussions about food, weight and a healthy diet. ‘My nine-year-old loves cooking with me, whereas my six-year-old prefers baking, but they’re both learning about ingredients and how to eat well from being in the kitchen,’ Nadiya says. Try this: Involve your child in planning a healthy, balanced meal that they’ll still enjoy eating. Use our planner to help them work out a day’s worth of healthy meals, and then the opposite: three unhealthy meals. Take the opportunity to talk about why we need foods from the different groups, and how to enjoy less healthy foods in moderation.